There are quite a number of Naptha engines around. 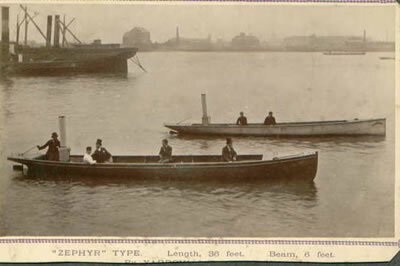 The Independance Seaport Museum has one in a launch on display. I think the Adirondack Museum has one. 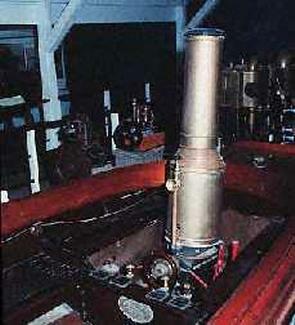 Henry Ford Museum has one in the launch Chiripa. I have also seen various ones owned by private collectors. The Adirondack Musuem published a little booklet in 1976 by Kenneth Durant called The Naptha Launch. I don't know if they still sell it or not, but if not it is probably available used. Nice little booklet with some history and technical inof. Also contains a bibliography of sources... Forest & Stream, RUDDER, Gas Engine and Power Co. instruction book, etc. Pat Spurlock is working on a current high quality book on Naptha engines and launches. 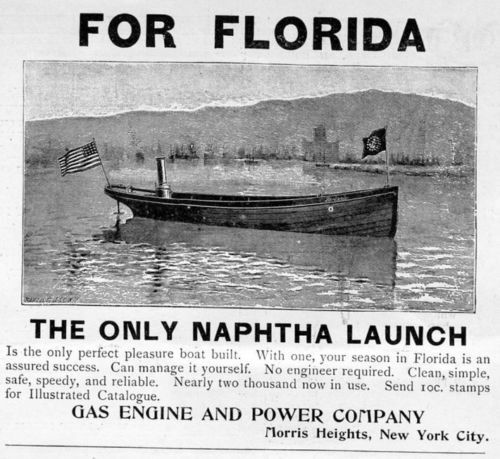 Does anyone know where we can see original Gas Engine & Power Co brochures about their naphtha launches, or Escher Wyss & Co brochures about the launches they built in Zurich under license, or Alco Vapor Launch Co. brochures? 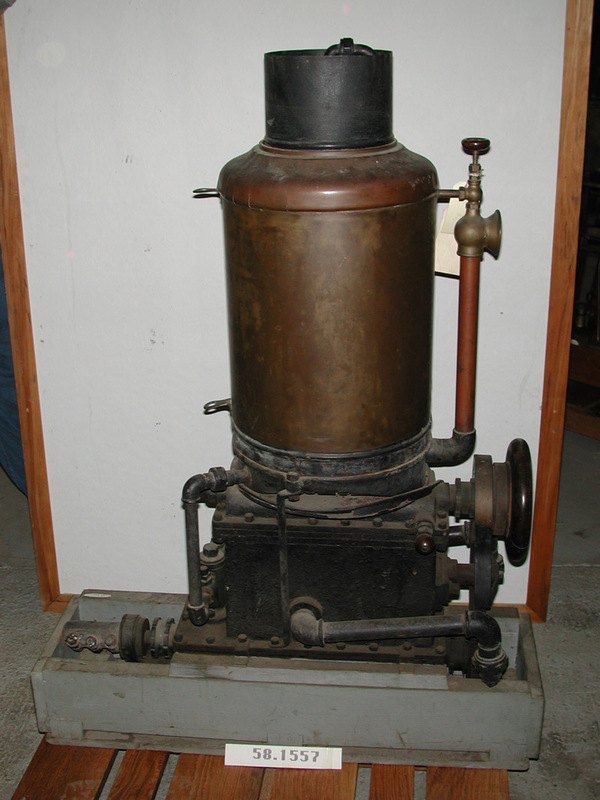 Alco Vapor was F. W. Ofeldt's later invention after the naphtha engine; it was an improvement, as it burned kerosine and boiled alcohol. We have exhausted the resources of Mystic and Mariners' Museums, and to complete the research we need to discover further resources, especially sources of the European builder. Does anyone know who is the old engine collector in Germany or Switzerland who might have an Escher Wyss brochure original. We have the reprint by Hillsdon. 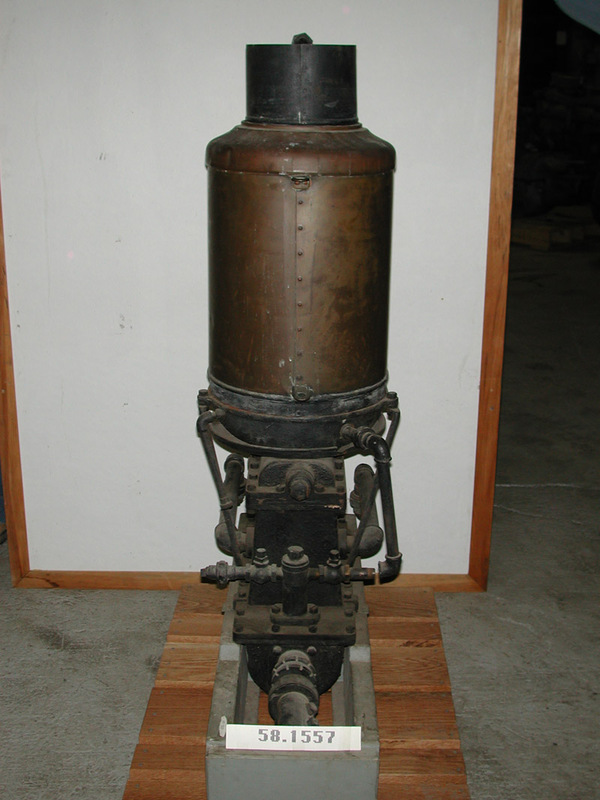 It is a fascinating step in the history of engines! I have a xerox copy of the sea shell shaped hand out from the 1893 Columbian Exposition from GE&P. It's mostly testemonials with 2 illustrations. I also know that the March-April 1961 "steamboats and modern steam launches" had a good article. 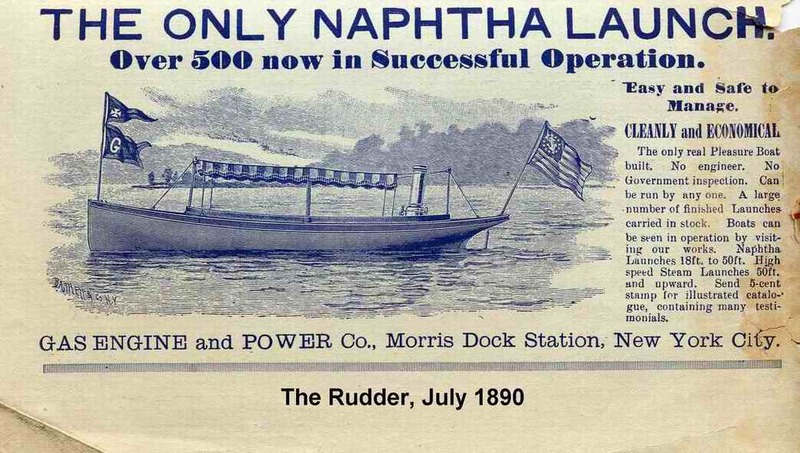 The Antique Boat Museum in Clayton NY has a naptha launch "similar" to the one in the Adirondack Museum. The one in the Adirondack Museum was owned by a friend of mines father thus some casual history is available. If there are questions I can research or answer on the boat in Clayton please advise. Does anyone have a pictue of an Ofeldt naptha launch? where was the Ofeldt launch made ? 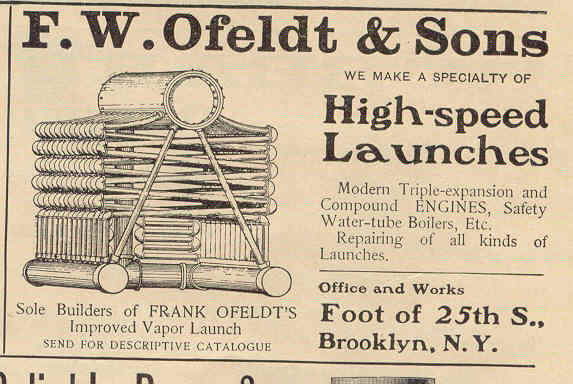 Located this 1903 ad,this was the power plant, I will look for the Launchs ! I wouldn't mind owning one of these. We know that The Henry Ford museum is a National Historic Landmark so that it is so great to be in there. The Henry Ford gallery in Dearborn, Mich., is reopening after an extended period of remodeling to unfold an account of America's obsession with the automobile. Beginning Jan. 29, the exhibition “Driving America” will open to the general public. The $8 million project signifies the first major overhaul of the gallery in 25 years, said Henry Ford museum president Patricia Mooradian. Same topic here Driving America opens at The Henry Ford on Jan. 2 . It will show and feature great automobiles in the automotive industry. Does anyone have DIMENSIONS for a 6hp Ofeldt or Escher Wyss Naphta Engine? 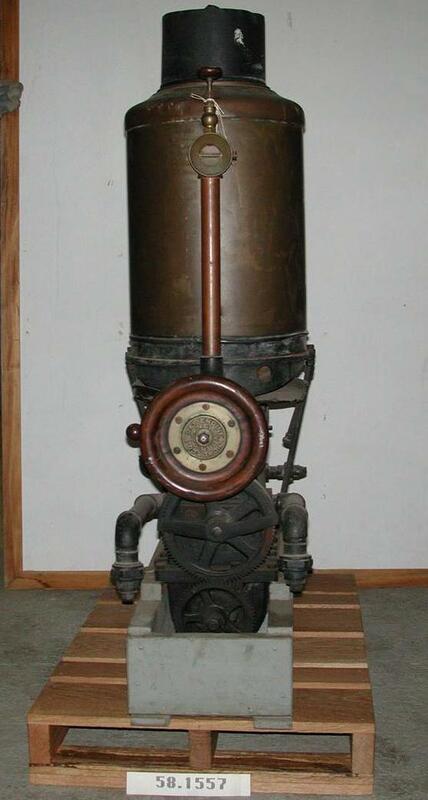 It appears a high class scale naptha engine model was built from Frank Olfeldt patent drawings. Spectacular documentation/photos/construction. Museums owning Naptha launches. Independence maritime museum, Philadelphia. 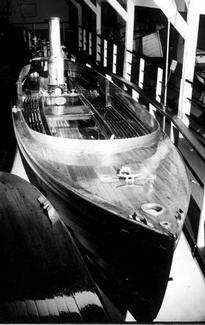 Mystic Seaport Museum, Mystic CT. Adirondack Museum, Blue Mountain NY . Antique Boat Museum, Clayton NY. Minnesota Lakes Maritime Museum, Alexandria MN. Anyone else know of other museum owned Naptha launches? Does your list of Naptha hulls converted include "Cathedral" on Fallen Leaf Lake next to Lake Tahoe? Hi Lou, Yes it does include "Cathedral". Great story by the way..
Oops, I neglected to include "Chirpa" in my list at the Henry Ford Museum,, Making 6 complete Naptha launches in Museums thus far. 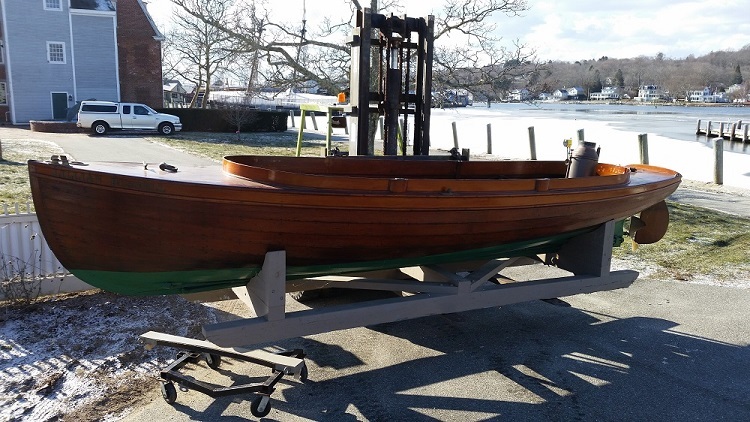 Mystic Seaport has an unmounted Naptha power unit in it's engine collection also. Mystic has a launch too. Not sure if it is the one that belongs to the engine you mention. A lot of their boats have the engine removed for some reason. In the notes it has the engine with a separate accession number. Maybe Scott will shed some light on the subject. 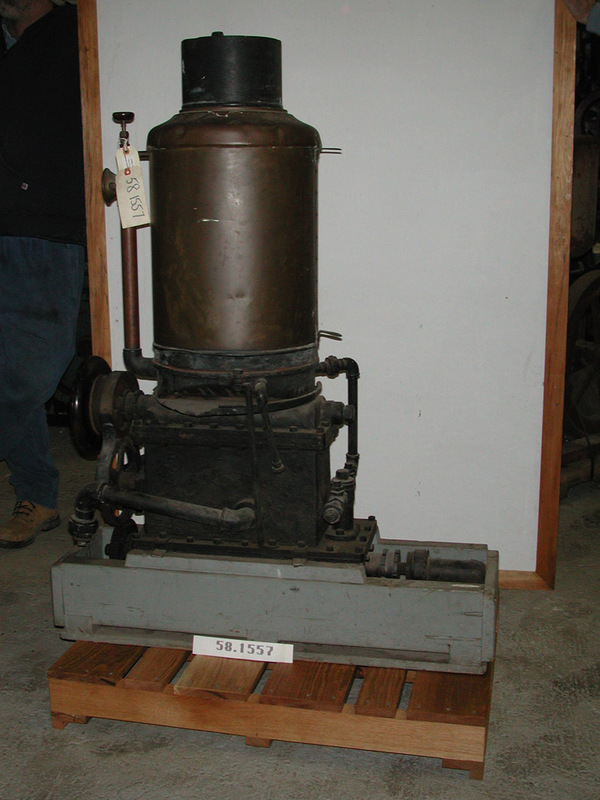 Maker: Gas Engine & Power Co. Here is another engine at the Mystic Seaport. Bruce is this the one you are talking about? Hi guys I bin off line for a wile we have one complete engine and one launch I think their 14 engines and 6 launches accounted for my college Jim rote a paper on this subject and has a lot more information then me.